An alien olive almost captured. Sometime in late November I looked up and saw the lights. I expect to see lights at Christmas time but it was after seven in the morning. The design was making me wonder what statement was being made. I was looking at a giant martini glass strung over three balconies of an ultra modern, boxy housing complex. Little did I know I’d be obsessing over it trying to get the right photo while discovering the limitations of my iPhone camera. Who makes the declaration, in lights no less, that the way to holiday enjoyment is through giant martinis with olives bigger than water melons? While writing this I imagined the King of Swing (think that character in the movie Boogie Nights with his robe flying open) with exotic mixed drinks and good times on his agenda, remaining sober enough to hang lights before his holiday binge begins. From what I can tell the lights stay on all day. I see them lit up in the morning and again in the afternoon as I pass through town and the sun is a half hour from setting. I view it with bemusement but I can’t figure out what it has to do with Christmas other than being a design made out of what most people refer to as Christmas lights. It is festive, fun and a subtle advertisment for people to cut loose and guzzle an oversized libation. There’s no mystery about that. 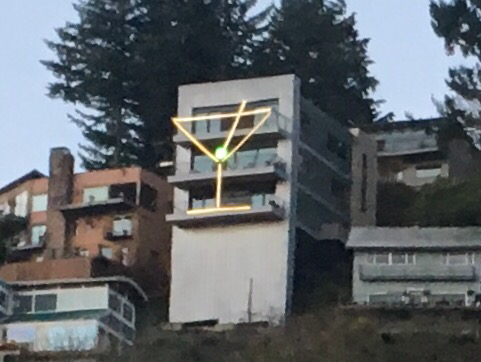 It’s a swimming hole sized martini glass on the hill side that borders on being tacky. Of course there’s a pun in there about this being in the “spirits” of the season. Groan, slurp from martini glass, ahhhhh! Afternoon martini at an angle. My effort to get a picture I could use for the blog became my biggest challenge. From the downtown Max stop it was too far away. The distance and lighting conditions in the morning and afternoon made it difficult to capture the true green color of the olive. Let’s face it, that is the nicest touch, otherwise it’s the outline of a glass. The stir stick is another great addition. This is an authentic and huge martini glass so my inability to do it photographic justice frustrated me. I took pictures at the Max stop cropping to produce a never quite right image. I took pictures on the bus as it roared by but that had limitations. 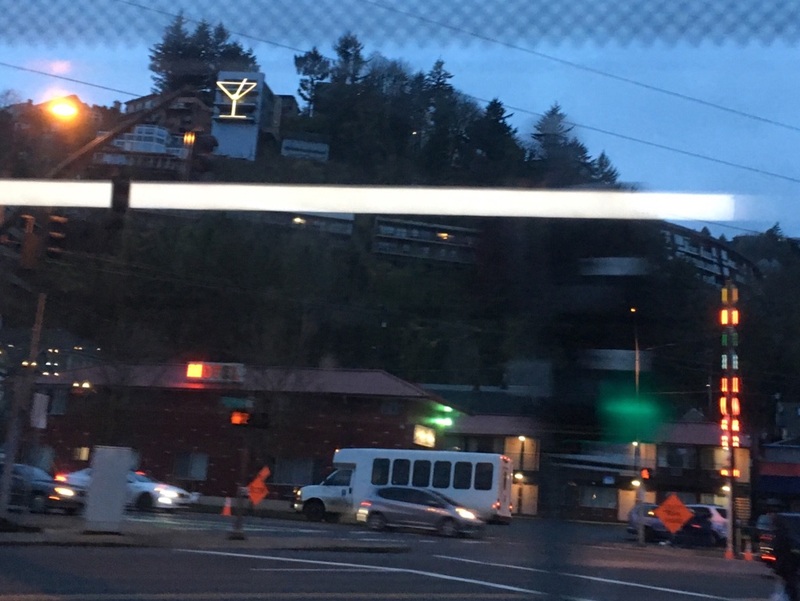 View from a bus with neon. The last ditch attempt was going to be walking to the bus stop closest to the martini hoping the morning light would cooperate enough for a satisfying shot while allowing for the opportunity to get back to the bus stop in time to get to work. 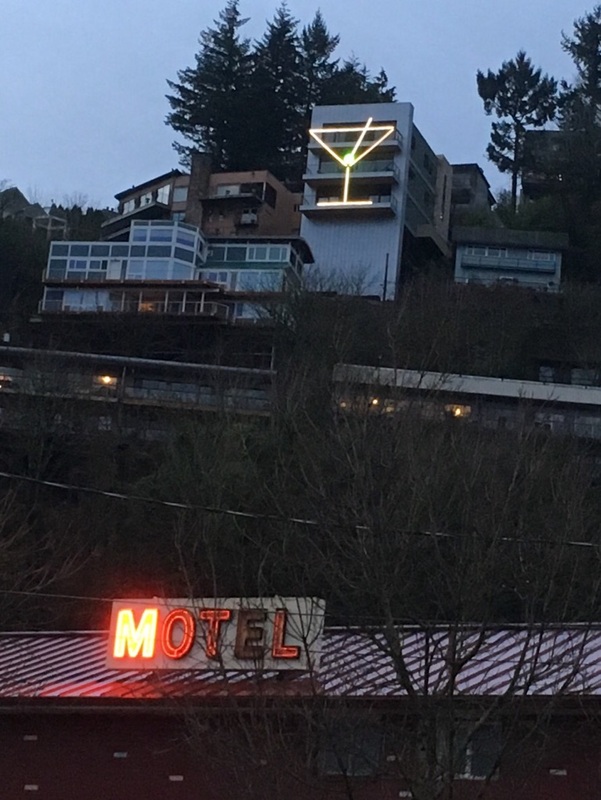 Above a motel, lives a martini. On a Monday morning I decided I had 8 to 11 minutes which was plenty of time to get to the next bus stop and get the best picture possible without renting climbing gear. As I approached, the martini glass had the aura of an oasis or maybe a mirage but the pictures prove it’s real. 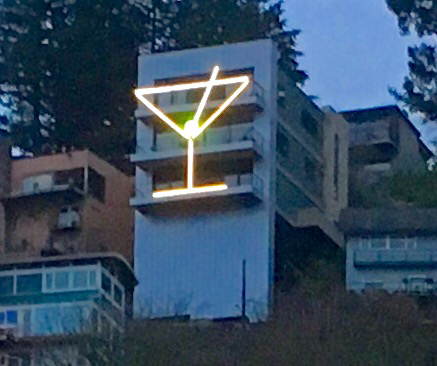 If someone were to climb up the hill and scale the porch they might be rewarded by the King of Swing with an appropriately sized martini or maybe get shot with a foreign made gun of an unusual caliber. I had to cross the tricky intersection of SW 5th and SW Broadway as a car was honking at a bicyclist. There above the motel dead center in my view finder, yet still too high in the sky, was that glass of holiday cheer. The olive was only glowing a slight alien green, details were lost even from that distance. I am happy with my iPhone camera in most circumstances but I also stubbornly refuse to read the manual. A martini lurks in the morning. So there you have it folks. 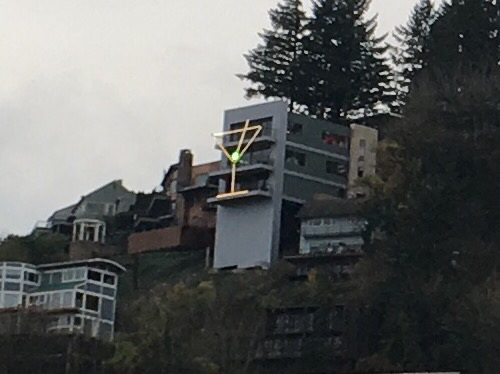 If you’re downtown in the PSU area look to the West Hills to see the oversized martini glass. It’s really something in real life. The olive glows a gorgeous green. I could not do it justice, but no photograph could. Kids put down your red solo cups and get classy. Raise a martini glass to this well lit example of good cheer. A year later the real story is revealed. Happy Holidays to one and all. Indulge yourselves a little bit, in whatever way you see fit, (giant martinis seem a tad extreme) and the Portland Orbit crew looks forward to seeing you or you seeing our work in the new year!